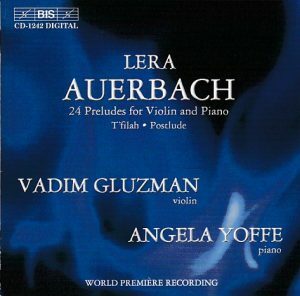 This was (says she) the first commercial CD of music of Lera Auerbach, published in 2003. 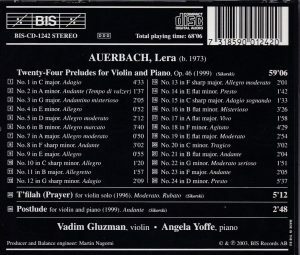 Composed in 1999 when Auerbach was 25, alongside similar cycles for cello & piano and solo piano, the 24 Preludes for Violin and Piano seek to re-explore, in her own words, “the value and expressive possibilities of all the major and minor tonalities”, “as valid at the beginning of the twenty-first century as it was during Bach’s time”. The Preludes are short, some less than a minute, the longest being the last, at 5 minutes 30. The result is a strange hodge-podge of styles. Influences? Shostakovich looms large, in the brooding, doleful, grim, aching violin melodies over piano ostinatos or stark piano underpinning (Prelude 1, 16, 22, parts of 24), sometimes dramatically rising to the instrument’s highest, flute-like registers (Prelude 12), but also in the Dance-like Preludes which sound like those grimacing, sardonic Shostakovich dances (9, 11). Auerbach likes writing on harmonics and sul ponticello for eerie and sarcastic coloristic effect (6, 11, 12, 16, list not limitative). She also likes the mysterious and atmospheric piano ostinato, as the one that opens Prelude 1 (obstinately repeating high note over deep basses alla Debussy “Cathédrale engloutie”), strikingly reminiscent (for me) of the second movement of Enescu’s masterful Third Sonata for Violin and Piano “in Romanian folk-stytle”. But the line that goes from Shostakovich to Auerbach goes also through Shostakovich’s radical pupil Galina Ustvolskaya, in the often pounding and cluster-invaded piano writing of 2, 10, 17 and parts of 24 (not limitative). But the line also goes through Schnittke, not just in those grim Shostakovich-like melodies (there is that too in the music of Schnittke), but also in the willingness to pastiche, play with and distort (through those sul ponticello and harmonics effects and other glissandi) very simple, wistful, pop-like or music-box melodies (Prelude 3, 15, 23), some drawn from composers of the Baroque era (Prelude 8 elaborates on a very famous Vivaldi Adagio I think, one of those tunes you’ve known since ever you were born that I wasn’t able to ascribe in the vast output of Vivaldi that lingers in my memory, maybe op. 3-11 or something like that), in the demented Tangos that could have been revised by Glass (4) seguing into mock and schmaltzy Waltzes (6). And then, sometimes, the music skids into other (past) directions, a long quasi-Ysaye cadenza for solo violin in Prelude 5, the intense romantic lyricism of early Enescu and the French romanticism-to-impressionism of, say, D’Indy or Vierne in Prelude 18. Of that bagful of influences and reminiscences, a singular and powerful voice nonetheless emerges, one that deserves to be followed closely. Lera Auerbach was born Russian but emigrated to the US in 1991, “becoming one of the last artists to defect from the Soviet Union”. Judging from her website, miss Auerbach seems to be a multi-talented artist, not only a composer and virtuoso pianist, but also an accomplished painter and art photographer, poet and author of her own libretti. TT 68 minutes. See my Auerbach introductory page for more info and resources.